AT LEADING FOR CHILDREN, we know that early childhood educators are always finding new and creative ways to nurture and inspire children–our next generation of critical thinkers and leaders. 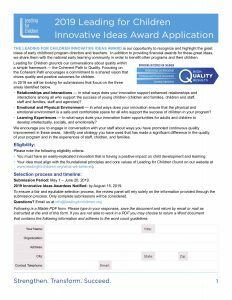 The Leading for Children Innovative Ideas Award is our opportunity to recognize and highlight the great ideas of early childhood program directors and teachers. In addition to providing financial awards for these great ideas, we share them with the national early learning community in order to benefit other programs and their children. 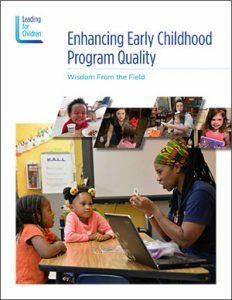 In 2018 the first place award went to Ryan Tauriainen, Director of Early Childhood at the Friendship Public Charter Schools in Washington, D.C. You can read about his idea, and those of our other winners, by downloading Enhancing Early Childhood Program Quality. Leading for Children grounds our conversations about quality within a simple framework that we call the Coherent Path to Quality. The Coherent Path to Quality is defined by elements of quality that are organized by three areas: Relationships & Interactions, Physical & Emotional Environment, and Learning Experiences. The winning idea (applicant and her program) will receive $2,500 and a plaque for display, the runner up will receive $1,000. Ten honorable mentions will each receive $100 worth of books from the The Book Vine for Children, our colleagues in Chicago. Entries will be reviewed by a panel of six expert judges and the awards will be announced by August 15, 2019. Winning submissions will be shared nationally on the Leading for Children website, in a free downloadable resource available on the website, and in a national communications campaign. Deadline: Applications must be received between May 1 and June 20, 2019.